Recently, we published an astonishing statistic: the State Department of Assessments and Taxation processed just nineteen new business filings in Montgomery County in FY16. In the year before, there were 57 new business filings in the county. We were skeptical of this statistic because it only applied to two years, thereby making it subject to flukiness. It is also conceptually incomplete. For example, a business headquartered in another Maryland county and opening a new location in MoCo would not be captured in new filings for the county. 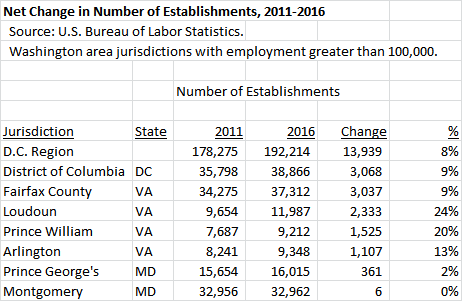 So we checked data from the U.S. Bureau of Labor Statistics (BLS) and confirmed a grim fact: MoCo’s growth in establishments is almost dead last in the Washington region. 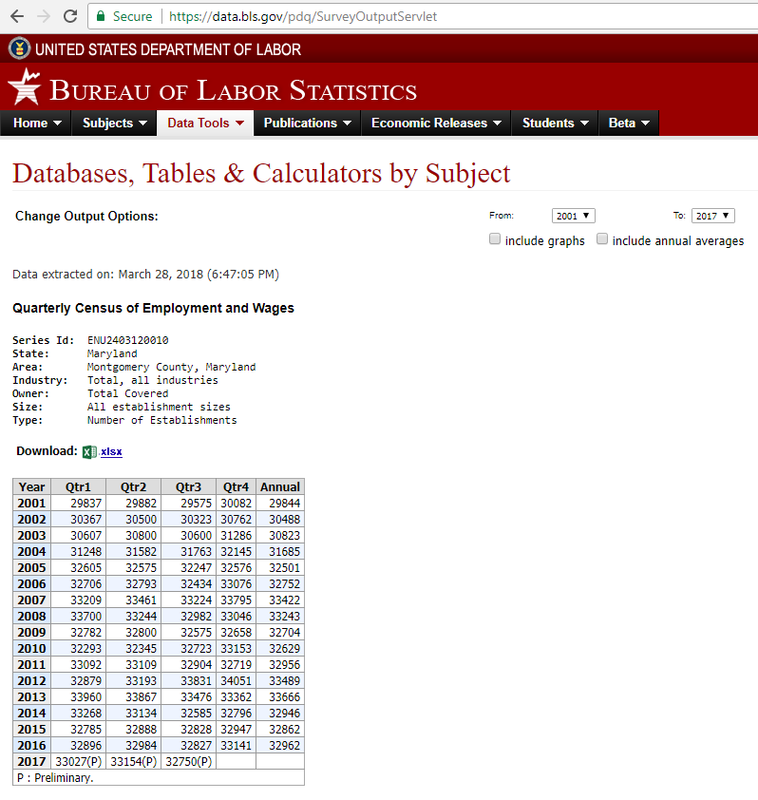 BLS has establishment data for states and counties going back to 2001 on its website. The screenshot below shows establishment data for MoCo from 2001 through 2016, the last complete year for which BLS has data. It shows a pattern of slow establishment growth that stopped in 2007 and has basically flat-lined since. 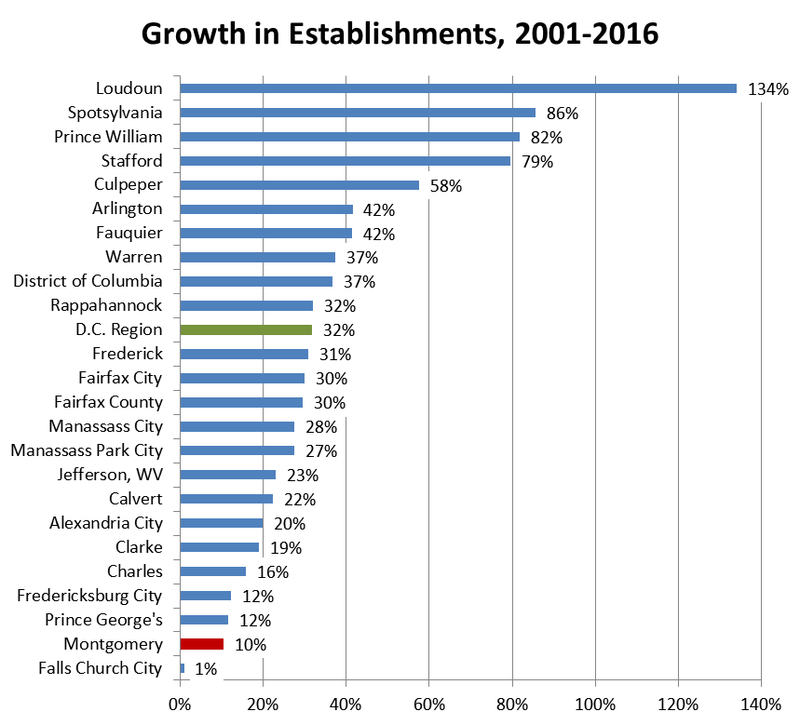 In comparison with the 24 jurisdictions that comprise the Washington metro area, MoCo ranks second-to-last in rate of establishment growth from 2001 through 2016. Only tiny Falls Church City was worse. The county’s rate of growth over the period (10%) was about one-third the region’s rate (32%) and Fairfax County’s rate (30%). There is one other difference between MoCo and most of its competitors in the region. Starting around 2011, the region began to recover from the Great Recession and most jurisdictions started growing their establishment count again. Between 2011 and 2016, the region’s 24 local jurisdictions collectively recorded a net gain of 13,939 establishments. D.C. and Fairfax County added more than 3,000 each. MoCo had a net gain of 6. Not 600 or 60. SIX. 2011 was the first full calendar year that the county’s FY11 doubling of the energy tax was in effect. Is that a factor in what has happened since then? The establishment data aligns with other data we have published on employment and income, the recent budget shortfall, the county’s increasing reliance on corporate welfare to attract and retain employers, the lack of new business filings and the impact of the liquor monopoly on the restaurant industry. The county has great assets, including its educated workforce, its superior schools and college, a large federal presence, low crime, high wealth in some of its zip codes and almost no public corruption. But we are underachieving economically and that is going to come back to haunt us sooner rather than later. Revitalizing the economy must be a key issue in the upcoming election.